BlogForce9: History Reporting App - Reporting on 40K records! History Reporting App - Reporting on 40K records! Script Limit : There is a limit on how may script we can run. And since the data from History table will require some transformation(User Name mapping,Date formatting,Field Api to Field Label etc), I was lil sceptical that I am going to hit the limits . Pagination : We cannot just show that many records on a single page! 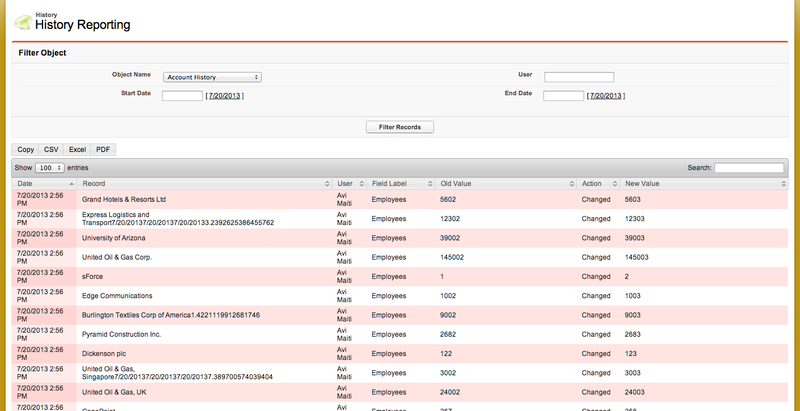 A way to implement Search , Filtering and Sorting : without sorting and search user will be almost lost ! So finally after weeks of work, A app that can show around whooping 40K records! 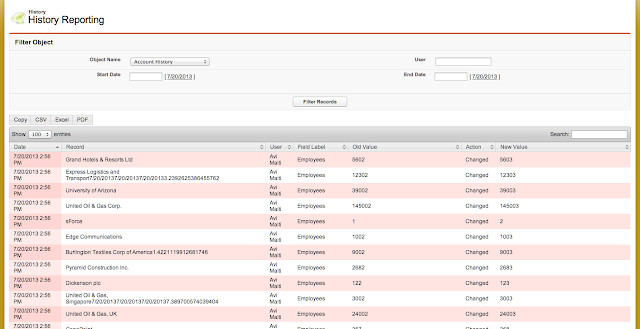 and that too with Export, Sorting and Pagination (Filters are in for the next version). Well this app shows the limit to which we can take a simple VF app. This is not limited to only History Objects, we can extend this to any Object with custom filters as per need. Currently the app is in Beta version, there are some bugs specially related to Case History, Activity History. Do you have posted the VF page and the controllers for - History Reporting App - Reporting on 40K records!? If, not, can you please publish?